Travel to the lowest point on earth in any land mass, 417 meters below sea level and be fascinated on your Israel tour. The quantity of water that is evaporated from the Dead Sea is greater than what flows into it, because of this the body of water has the highest concentration of salt in the world, 340 grams per liter of water to be exact. The water mass receives its name “Dead Sea” because of its salinity which prevents the existence of any life forms in the lake. The salt however, has provided tremendous relief to visitors whom swim in the water to benefit from its healing properties. It is a unique place in the world, so different yet to beautiful and interesting. The Dead Sea is perhaps, the greatest natural health spa in the world ever created. Salt is produced in the southern section for industry, while the northern section promotes tourism and health. The unique composition of the salt and minerals is what scientist believe makes the water and mud so beneficial for the body. This is why perhaps you will see many visitors and tourist enjoying a mud bath covering their bodies from head to toe. As if all this were not enough, bromide in the air is also believed to be beneficial to the body. The Dead Sea in Israel is with out question a great national treasure and a must see in your holy land tour to Israel. The western shore of the Dead Sea inside Israel, provides organized beaches and bathing areas that provide easy access to the waters for bathing, and for a more pampered tourist, Neve Zohar and Ein Bokek are two excellent beaches, providing first class services to tourists. You can find a variety of hotels, guest houses, restaurants, shopping centers, and many choices of tours and activities anything from bicycle tours, art and culture activities to rappelling, and camel tours. The Dead Sea is located on the edge of the Judean Desert , a hot barren region, which is also an important center for tourism with Mt. Sdom, Nakhal Darga, the Ein Gedi nature reserve and the Einot Tsukin reserve, alongside these breathtaking natural wonders, there is also some truly historic sites to see with significant historical importance in Israel’s past. The most prominent and famous is of course the great ruins of Masada fortress, and the ancient Ein Gedi and the Kumran cave site where the ancient Scrolls were discovered, this includes the famous Dead Sea Scrolls , which provide insights into early Christianity and the Essenes sect that lived at this ancient community which is widely regarded the beginning of Christian monasticism. 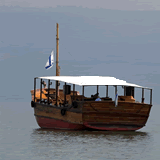 The Dead Sea’s northwestern region has been for centuries a holy land tour destination, specially during Easter. After visiting here, they regularly go to Jordan, the traditional site of Jesus baptism, and many today continue with these traditions. When you visit the Dead Sea on your holy land tour, make your experience complete by visiting the amazing monasteries built right on the cliff walls. Among these monasteries is St. George, Quruntul, Khozeba and Mar Saba. Some of the monasteries are still operating and welcome visitors.